Set in the heart of one of the most desirable coastal communities in Southern California, this hotel is just a few blocks from Venice Beach. The hotel offers easy access to a variety of shopping, entertainment and over 30 restaurants within walking distance. Spacious new guest rooms feature plush beds, marble bathrooms with premium bath amenities, flat-panel HDTVs and other thoughtful amenities. Floor-to-ceiling windows offer panoramic views of Marina del Rey, Southern California coastlines or the city and mountains. 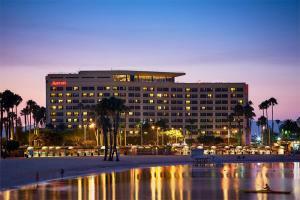 Located in Marina del Rey, about 4.5 miles from the Los Angeles International Airport.